First and foremost, your resume never helps you to get the job you’re aiming at. It can just make you stand out of the pack provided it’s adequately compelling and relevant. Let’s get a couple of things clear to begin with. 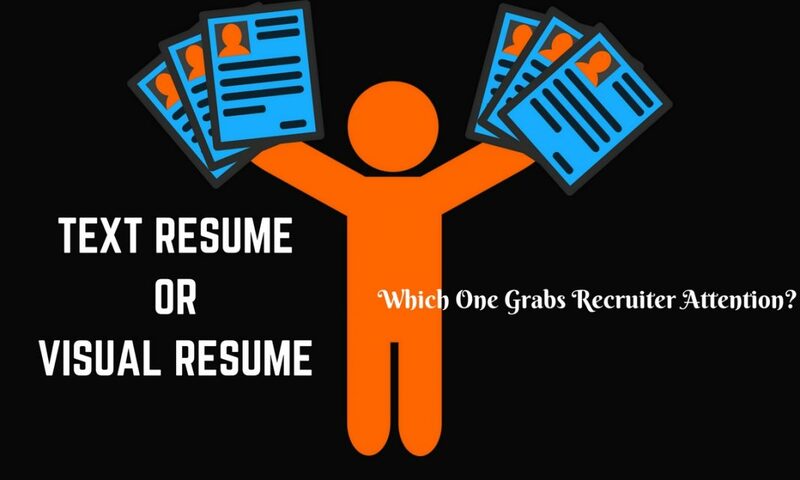 Unlike what many may think, resumes aren’t read at the first. Instead, the HR department scans, scores and sorts them. Thus, it can be said that a killer resume only helps you to land at the interview board and not to get you hired. The actual purpose of your resume is to grab someone’s attention that matters. Simply put, you need to convince the people that matter to get that juicy job interview because there are likely to be hundreds of applicants, who would be trying to do the same. Over the last few years, technology has transformed the mode of corporate recruitment, which has taken the importance of a resume to a completely level. Today, only text resumes may not be sufficient to catch the attention of your prospective boss. That’s why many tech-savvy job seekers are creating visual resumes that may include social resumes, presumes, and infographic resumes, amongst others. However, the main question is still unanswered to a majority of job applicants – will it help or mar the chance of getting that coveted job interview? The answer depends on some key factors. In this post, we’ve explored these factors to help you decide which one would be your best bet. If you’re a desperate job seeker in today’s competitive market, you are most likely to apply for a significant number of jobs. Before you continue with your search and submit that most important document, which is your resume, with every application, it’s immensely crucial to clearly understand what your prospective boss would be looking for in your resume at the first glance. To begin with, it depends on the position for which you’re applying. For instance, if the vacancy is in the accounts department, you must hold a bachelor’s degree in accounting. If it’s tech-related, you need to have the specific certification according to the vacancy like network administrator, computer programmer or system analyst. Overall, recruiters want to hire someone whose career progression relates to the mode of vacancy. They don’t want someone onboard who has worked in different fields without developing and nurturing a specific skill set. Secondly, they’ll look at your location. If it’s a location independent job, you should do fine. On the contrary, if it’s a local search and you’re from outside, it’s most likely that you won’t get the call for an interview. Thirdly, most of the recruiters look at an applicant’s present company and position to determine how close of a match the applicant is in his/her most recent position. Finally, they look at the job history, duration of working in each position, how the applicant demonstrated his/her success and accomplishments etc. A study conducted by “The Ladders” revealed that average recruiters only spend six seconds to have a glance at a resume before deciding whether an applicant is worth calling in for the interview or not. Hence, you need to be absolutely sure to incorporate these things to increase your chance of getting that interview call. Today, numerous options are available out there that aid job applicants format and design their resumes to make them beautiful as well as readable on the paper. Though the appearance of your resume is surely crucial, if you plan to send it through the internet, plain text format resume is perhaps your best option. Writing a resume perfectly in the first place and making it visually appealing is unquestionably a daunting task and rewriting it in plain text is quite intimidating. Though job board sites today have become more advanced and allow you to upload your resume in Word doc format, the final version may become garbled when it reaches the employer’s screen. In addition, there’re forms available in several recruitment portals that enable you to automatically build your resume but many resume experts don’t recommend the use of this service. Let’s have a look at the reasons. You can’t select the resume style. A spell checker can’t be used. It’s quite time consuming to perform this task for each and every recruitment portal. Web addresses are clickable in a plain text document, which allow recipients to go through your relevant public profiles by simply clicking on them. Plain text messages are much smaller in size that facilitates them to be delivered and downloaded quickly. Since they’re virus-free, they usually never land up in a recipient’s spam folder. So, it’s wise to take some time out to create a plain text version of your resume that you can upload to any job portal. It might not be highly attractive, but the portal won’t jeopardize it. Visual documentation presentations that include infographic and presentations. Video presentations that include audio, video, PowerPoint slideshow or combination of all. Pull out your standard resume. Highlight the key points in the resume that you wish a prospective employer to see. Script it and develop a storyboard of the resume. Remember, the more you’d make it attractive, the more chances it’ll have to be seen by an employer. If you find out any opportunity to use visuals, graphs or inforgraphics, use it. Once you’re done with the storyboard, insert relevant pictures that would make it easy-on-the-eyes. Finally, carefully arrange the resume slide by slide. Unlike traditional resumes, visual resumes help you to provide a prospective employer with more information about you in an attractive and crispier way. A visual resume full of relevant images, audio files, web links and video footages appears more appealing than even an interactive video, which in turn would encourage prospective employers to have a second look at it. Recruiters like Text or Visual Resume? It’s a well-known fact that uniqueness of anything sets it apart from the crowd and the same thing is applicable for your resume as well. If you can demonstrate your expertise and other relevant information in such a manner that it leaves a permanent impression on the mind of prospective employers and hiring managers, you can rest assured of the fact that your resume will get better attention compared to other candidates having the same expertise or even more. A visual resume aids you to do exactly the same. While conventional resumes are bundles of personal, educational and professional details of every applicant, a professionally and beautifully created visual resume will always have a greater chance of helping you make your way to that much-desired job interview. It communicates the same things that a text resume has but in a much more attractive manner. The multimedia-based highly interactive format of a visual resume is capable of amazing the prospective employers and makes you score over the pack. So, if you want to obtain the maximum out of your expertise by presenting a stellar resume, create a visual resume and send it over the next time you apply for a position. To make the job easier, you can take help of various online resume experts available out there that’ll give your resume a more impressive look. When it’s related to your career, nothing can beat the importance of your resume. Whether you are a fresher looking for your first job, or midway through your career seeking a change, an impressive resume can take you places. If you’re a fresher, you can get your first job through the campus interview round, while in case you’re a mid-level executive, you will need to find out relevant job portals that match your skill sets to find your ideal job. However, in both the cases, you need to prepare a killer resume that would easily help you to reach an interview round. We’ve already discussed the significance and advantages of visual resumes compared to the traditional ones. In addition, it may sound a little surprising but a visual resume has the ability to increase its accessibility to more organizations and employers and this often happens across the borders too. Thus, a visual resume paves the way for getting international offers as well. The most interesting part is that all these often happen without keeping you in the loop. This is something absolutely impossible with traditional resumes. The bottom-line is – anything that increases your visibility in today’s competitive job market is worth giving a try. About the Author: Ben Karter is a senior recruiter for Xist4. He also works as a consultant & trainer for top IT companies. He writes about the technology that IT decision makers need to know about, and the latest happenings in the tech scene.